Commodities headlines have been dominated again this year by petroleum. Sluggish prices, falling extraction rates and exporting nations in trouble have provided much fodder for the specialised media. As a matter of fact, prospects have not changed that much from last year, in spite of a deeper than expected fall in extraction rates. There are other natural resources though, that provide perhaps a more vivid view of your relationship with the finite planet we leave in. 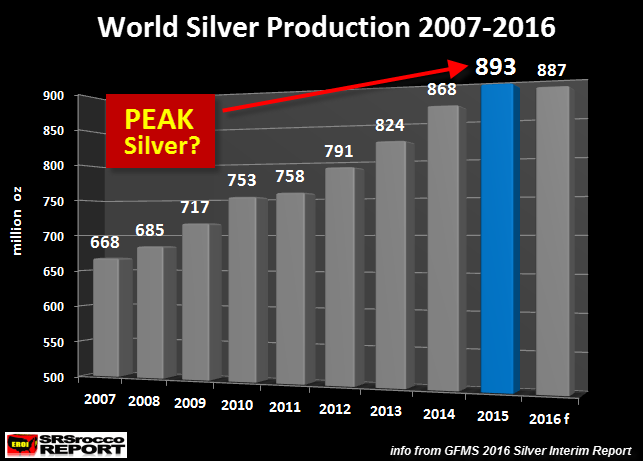 Recent data dug out by Steve StAngelo at the SRSRocco Report points to a peak in world Silver extraction in 2015. The likelihood of this being a terminal peak is rather high, more so than 2015 setting the terminal peak for petroleum. Back in 2012 Ugo Bardi invited me to write a chapter on precious metals for what would become the book entitled Extracted. I gathered a number of information bits laying around in my computer to provide a biophysical perspective on two very different products of the stars: Silver and Gold. Gold is a very mature commodity, industrial use represents only a fraction of consumption, recycling is almost half of production and above ground stocks equal almost one hundred years of mining. The outlook for silver is much the opposite: industry accounts for much of consumption, recycling is at best one fifth of consumption and industrial above ground stocks account for less than one year of mining. Silver produced a first warning shot at the beginning of this decade when prices briefly surpassed 1 600 $/kg. 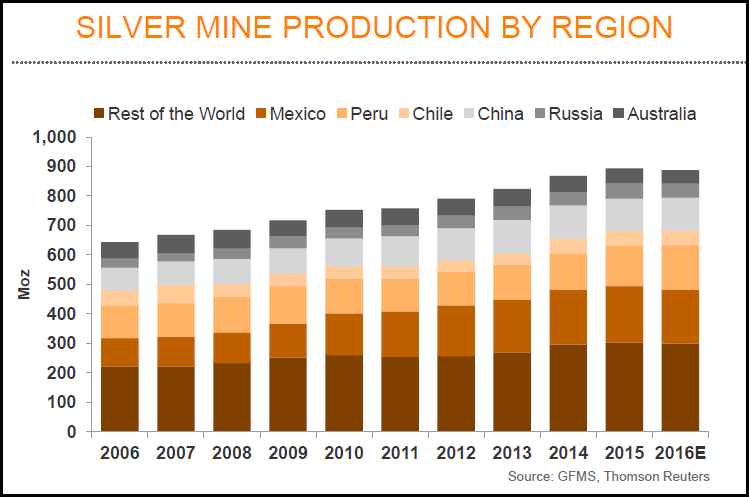 However, outflows from above ground stocks and the extraction of silver as a by-product in mines dedicated to other metals (e.g. copper, zinc) have kept prices low the past few years. The outflows of silver from industrial and investment stocks have so far avoided the prices hikes expectable from this transformation. 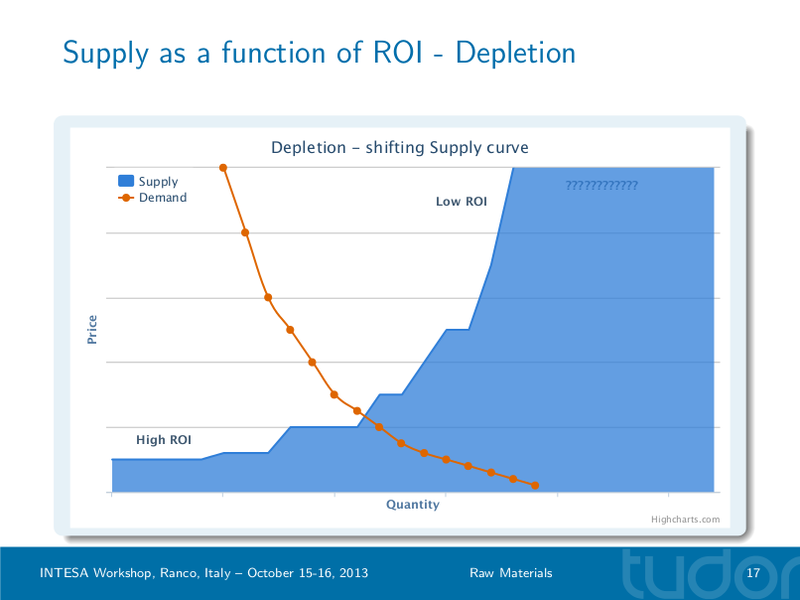 But they can not avoid the reflex consequence: mined volumes declining. Hence the data compiled by Steve StAngelo. Another important data bit pointing to this transformation of the Silver supply curve is the concentration of extraction in a small number of regions. In another image dug by Steve StAngelo it can be seen that increases in extraction the past decade are down to only six countries. Instead of abundant and spread out low entropy resources, the planet is left with sparse below ground stocks of the metal. 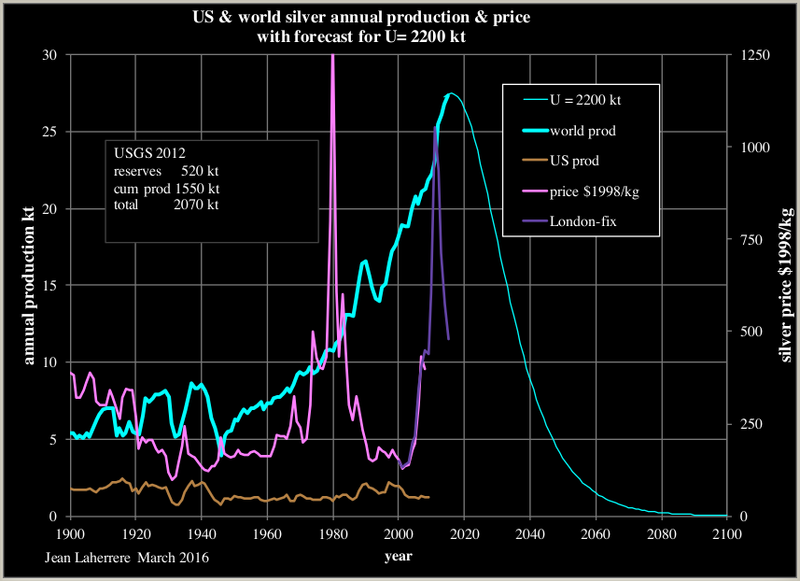 Recent estimates of underground silver resources issued by the USGS are presently in vicinity of 500 kt. But just a decade ago the same office was estimating 400 kt. In a reaction to the data compiled by Steve StAngelo, Jean Laherrère sent the graph below, based on an estimate stunningly similar to the USGS. This could well be it for silver. Hereafter, silver extraction rates equalling those of recent years will require extracting increasingly lower quality resources. The silver market is headed for a remarkable transformation during the next decade, either with the rise of a proper recycling industry, the rise of dedicated mining or simply with the substitution of silver in application industries. Keep in mind though that silver is the most conductive metal known in this planet.